Radiotherapy to the brain involves exact positioning of the radiotherapy machine. It is necessary for the patient to keep very still while having treatment. This is because small changes in the position of the patients head can greatly affect the accuracy of the treatment. To help keep the patients head still, a radiotherapy mask is made which will fasten to the radiotherapy machine couch. 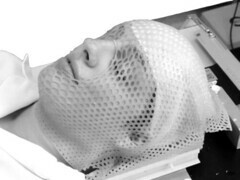 What is a radiotherapy mask? Depending on the treatment, a mask will be made from either a thick sheet of clear plastic or a sheet of thermoplastic material. Holes are cut out for the patients nose, mouth and sometimes eyes. The patient can breathe normally during and after having their mask made. A finished clear plastic mask is shown to the right. The mask fits onto the top of the treatment couch that the patient lays on to have their radiotherapy with little plastic clips. The mask ensures that at each treatment, the radiotherapy beam is accurately directed at the treatment area. It also means that the marks outlining the treatment area are placed on the mask and not on the patients face. How is the mask made? The patient attends the Mould Room in the Planning Clinic to have their mask made. 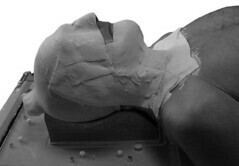 To make a radiotherapy mask, an impression of the face/head is required. This is done with Plaster of Paris bandages, moulding them to the correct shape, without covering the nose or mouth. It is a bit like having a face-pack on. It takes about 15 minutes to take the impression but patients are asked to allow at least an hour for the whole appointment. Not at all. The plaster will warm up a little as it sets, but this is normal and is not uncomfortable. There may be a little noise as the impression is removed but that is all. If the patient has a thermoplastic mask, shown on the right, the procedure is slightly different. When heated in warm water (bath temperature) the thermoplastic sheet softens. It is then placed over the patients head and the technicians gently mould it to the patients head shape. It gradually hardens over five minutes, when left at room temperature and is then lifted off the face. There may be holes for the patients mouth and nose. What happens after the impression? 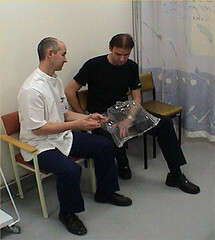 The patient is given an appointment to return to the clinic for their mask to be fitted. 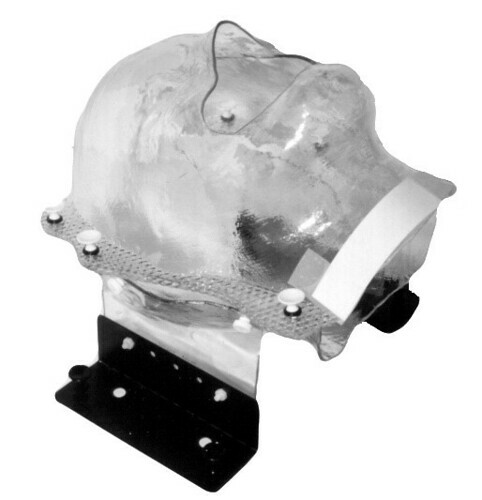 The image on the left shows a finished clear plastic mask. This article has been reviewed by Russell Fitchett, Superintendent Radiographer, Norfolk and Norwich University Hospital. SAPE ERROR: Нет доступа на запись к файлу: /home/btbuddies/public_html/templates/68portal_orig/images/cache/3f9e7ffccc6995af0bc4886a484f1db1/links.db! Выставите права 777 на папку.